The East Coast premiere of Cold Mountain, Opera Philadelphia’s co-commission with the Santa Fe Opera and Minnesota Opera in collaboration with North Carolina Opera, offered much to admire and enjoy. For the production itself, and the performers involved in it, no praise could be too high. Director Leonard Foglia marshaled his numerous forces with unfailing clarity and discretion, in a set by Robert Brill that was at once darkly threatening and, with an array of hefty planks that could be transformed in a moment into a forest or a boat, highly practical. Lighting, costumes, and the other paraphernalia of production were impeccably handled. Corrado Rovaris paced the score masterfully. 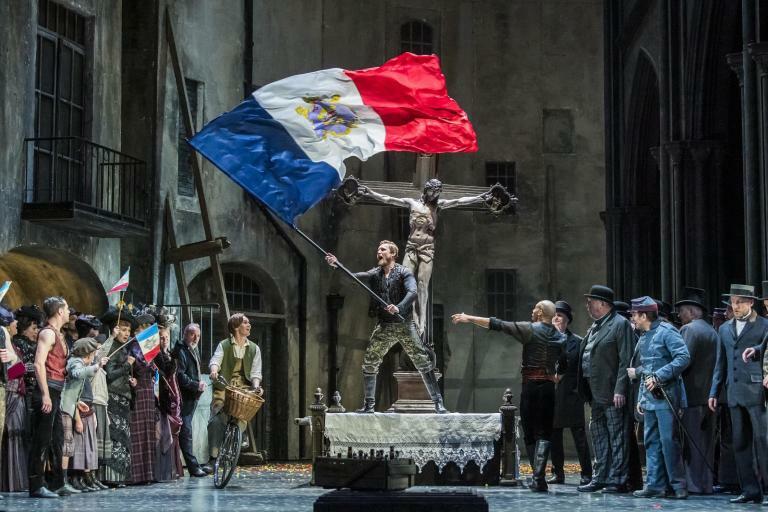 The onstage cast, featuring illustrious principals, such major artists as Anthony Michaels-Moore and the velvet-voiced Marietta Simpson in relatively modest roles, and Elizabeth Braden’s splendid chorus, were all equally impressive vocally and dramatically. Jarrett Ott, who had stepped into the central role of W.P. Inman at little more than a week’s notice in place of Nathan Gunn, filled that eminent baritone’s shoes with complete success. Isabel Leonard was her familiar adorable self, making of the long-suffering Ada a truly inspiring figure. Cecelia Hall was a notable hit as the tomboyish Ruby, who helps Ada to adjust to her impoverished circumstances, and as Teague, the eager nemesis in pursuit of deserters, Jay Hunter Morris, whom I have had occasion to admire for his noble Florestan, proved himself no less capable of portraying a thoroughly nasty character with chilling conviction. The work itself is clearly the result of close collaboration between Jennifer Higdon and Gene Scheer. The latter, who was working on the basis of Charles Frazier’s novel of the same title, is a skilled and experienced librettist—he has collaborated fruitfully more than once with Jake Heggie—and he furnished his composer with a well-conceived and strongly atmospheric text, one questionable touch excepted. I did not object to the reminiscence of Orpheus’s colloquy with Charon in Monteverdi’s L’Orfeo: it was unobtrusive and effective enough. But, presumably feeling the need for a few minutes of comic relief, Sheer and Higdon had dragged in from Die Zauberflöte (where it sets the tone of that semi-comic masterpiece perfectly) the scene of the ladies vying for guardianship of the sleeping hero, and in this prevailingly grim context the resulting frivolity seemed glaringly incongruous. But when all is said about the story, the text, and the performance, this, you may wish to remind me, is an opera I am discussing, and it must ultimately stand and fall by virtue—or vice—of the music. Though I found considerable promise in a concerto Jennifer Higdon wrote in her Curtis student days, I have not been much of an admirer of her subsequent work. Against that background, I enjoyed Cold Mountain more than I had expected to. One love duet, in the middle of Act I, was fairly ravishing in effect, and there was some choral writing that, if it did not quite. emulate the prisoner’s chorus in Fidelio, was affecting enough to recall it to mind. Higdon’s orchestral writing in the opera is resourceful and impressively varied, though the sharp percussion responses to the frequent references to guns or shots are merely banal. But while she is sympathetic enough to the voices, and never tortures them in the manner of some contemporary composers, Cold Mountain shows no trace of the gift for illuminating character through melodic line that distinguishes the greatest operatic masters, from Monteverdi and Handel by way of Verdi and Strauss to Britten, whose musical language, Higdon opined in an interview, “was the closest to mine.” All the characters in this opera, despite their various orchestral underpinnings, sing the same music. There are essentially just two melodic phrases in the work, in “tonic sol-fa” terms roughly “mi-sol-la-sol-sol-mi,” and (the same shape at a different angle to the key) “la-do-re-do-do-la.” With an occasional modification or expansion, they are subjected to innumerable repetitions, and you could confidently predict, when the start of any line of text began, that it would inevitably end with that falling minor third. With all its virtues, therefore, I do not think Cold Mountain is a work for the ages. But who can say? After all, it’s the composer’s first opera, and Beethoven’s first, Leonore, had to go through a raft of modifications before it ended up as the immortal Fidelio.